RPGeniuses Episode 1 - "Knife to Meet You"
Grandgia: Super-Continent of Possibility! After millennia of countless wars, crumbling empires, and colossal catastrophes, the land of Grandgia has now entered an era of relative peace. Now -more than ever- is the perfect time for adventurers to set out and find the secrets and treasures that were lost to years of chaos. But are all treasures and secrets best found? 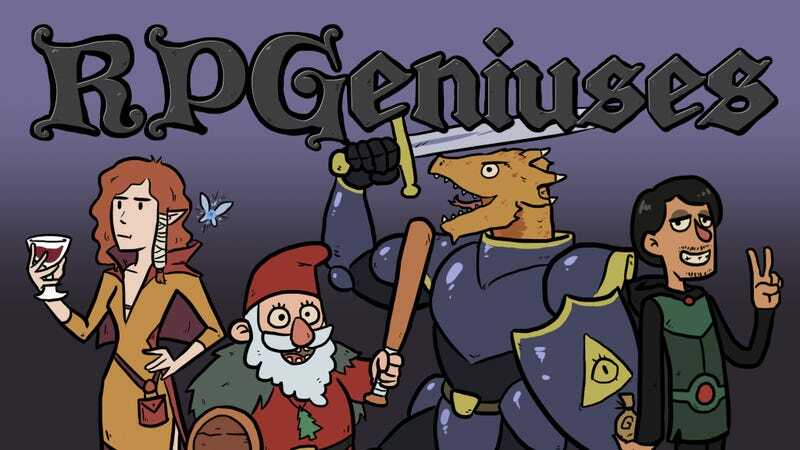 RPGeniuses is a series dedicated to the adventures of five friends trying to play Dungeons & Dragons and failing miserably, but having a good time anyway. The adventures are available in podcast form, but feel free to read a brief summery below! All four of the adventurers received the same message promising them great glory and fortune if they were to meet at the Silverbend Inn in a small town near the Feywoods. These four adventurers showed up for this shot at greatness, wealth, and the chance to get out of a boring town populated by old people. They were Nestariel, the half-elf Warlock. Befriending a Fey at a young age, they sealed a pact that granted Nestariel insight into the weird magics. Now she is bored and wishes to see the world that lies beyond Silverbend. Corveth, the human rogue hails from the land of Hexico. He is a noble thief who uses cunning and the occasional pretend-to-be-a-long-lost-uncle-to-steal-a-family-fortune scam who wishes to amass riches and test his skills. Steve, the dragonborn paladin, serves a mysterious patron after the destruction of his clan. He seeks vengeance, power, and a solid internship that might lead into education opportunities or a steady career path. Spad Deerman, the gnomish druid who wanders about in his old age talking to animals, trees, or -more likely- nothing in particular. He’s lonely. The party is there to meet Marty, who offers them a position in the Longbrow Adventuring Company. The LAC specializes in procuring lost items, consulting on the magical arts, protecting those who need safe passage, and generally traveling to exotic locations and doing cool things. Marty promises that they can find all that they are looking for if they join the company. He is willing to jump them in if they help him deliver a dagger to the hands of the LAC’s founder and CEO, Cornelius Longbrow. After some haggling (Steve agreed to work as an unpayed intern, Nestarial demanded Steve’s pay, and Spad paid Marty 5 gold for some reason) the adventures agreed and set out on their delivery mission. Things started to look fishy when they were told they needed to pick up the dagger miles outside of town. Waiting for them are two people who look like land-pirates. They’re bandits. “You were supposed to come alone.” they say. Marty and the bandits argue and Spad hears a rustle in some nearby bushes. He alerts his party to the noise. Steve -like a father showing that there are no monsters under the bed- cleaves the bush in half with his longsword. A goblin’s head flies out of the bush, flies through the air, and lands nearby. The bandits initiate combat after seeing their hidden comrade get beheaded. Corveth locks himself into combat with one bandit while the other flees for his life. Nestariel attempts to Eldritch Blast the escaping enemy, but the spell literally blows up in her face. Steve hurls a javelin at the bandit as well, but it was thrown with such gusto that it completely misses. It got amazing distance though. Locked in combat with Corveth, the first bandit gets in a few good hits. Spad climbs atop Steve and uses the spell Thorn Whip, effectively killing the bandit and pulling the upper part of the bandit’s corpse so that it hits Steve’s shield. It sounded exactly like a gong. Thanks for reading and possibly listening to this adventure. I’m the DM of the game and my friends been having so much fun playing Dungeons & Dragons that we decided to share out adventures. If you want, follow the YouTube and stay tuned for more chapters of this amazingly dumb epic!